We are constantly being influenced by the world around us. Television, advertising, and the other people in our lives are constantly trying to change how we think. Sometimes these influences can be positive, like the love of family and friends. But often they can be negative, and can drain us of our own positivity. 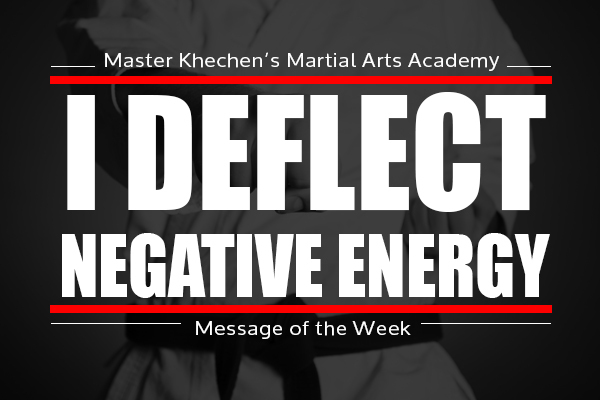 “I Deflect Negative Energy!” is about not letting negative situations or negative people influence the way we think, feel and act. It reminds us that we can’t allow others to take away our happiness and our sense of self-esteem. 1. Avoid negative environments – If you know that going somewhere might lead to your being influenced to make bad decisions, don’t go there. 2. Avoid negative people – We all have people in our lives that have the ability to completely drain your energy. They are constantly complaining, are never happy, and always seem to be in a bad mood. Do your best to avoid these people as much as possible and when you can’t, don’t lower yourself to their level. 3. Don’t take things personally – Most of the negativity we encounter isn’t about us, it’s about the insecurity, frustration and fear of the people giving it out. Whenever you encounter someone who has a negative mindset, remember that you have a choice about whether or not you let them affect you! Well said sir, Words were right on time. Thanks to You and the whole school for your positive influence in my life.